Revved for FTL | SPACE-BIFF! If this image hasn’t already made you uncontrollably excited, you may have missed out on childhood. The Federation has had a bad year. Taxes are down, overheads are up, and to top it off the Rebellion has begun a massive assault with an aim to topple the (generally benevolent) government. Enter The Kestrel, which stores data that is crucial to the survival of the Federation, and the Rebels know it. 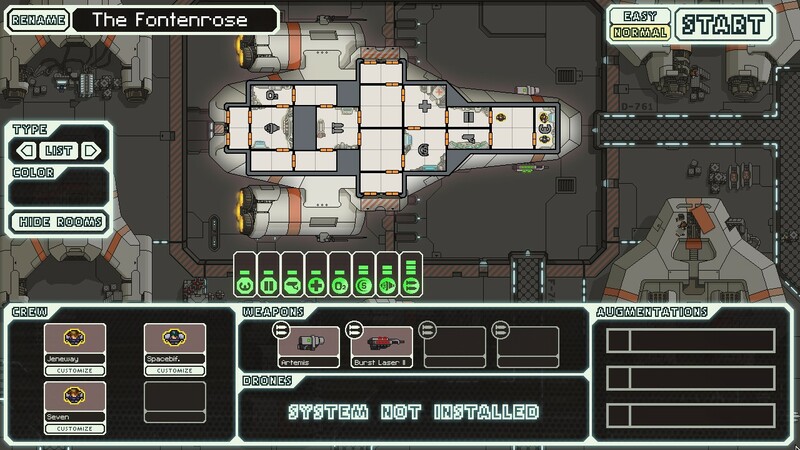 So begins FTL, the upcoming indie game from Justin Ma and Matthew Davis. I’ve been playing a fair amount since it entered closed beta, and I suspect it’s going to be one of the best indies of the year. The Fontenrose at dock (click to observe its glory). 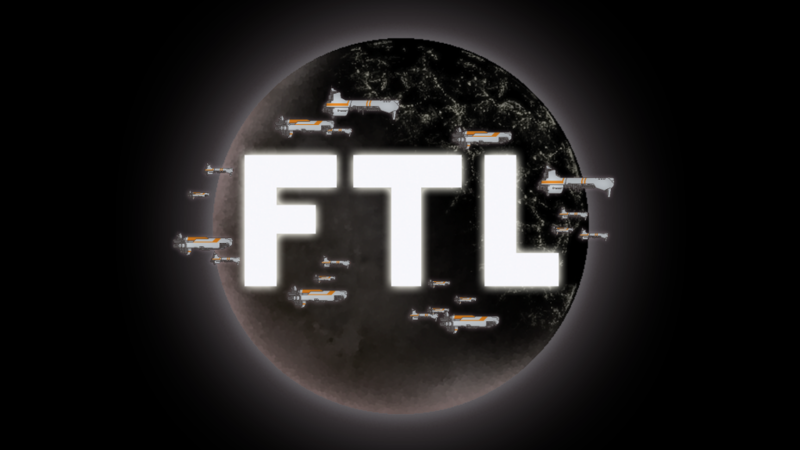 You’ve probably already heard plenty about FTL, given the extensive attention it’s been receiving, so I’m not going to bore you with the basics (though if you haven’t heard of it, Tom Francis of PC Gamer called it “Firefly by way of Spelunky.” And if you haven’t heard those references, then it’s a space game with roguelike-like gameplay. If you haven’t heard of roguelikes, that means the gameplay is highly random and very lethal, and that’s about the best I can do parenthetically). The one thing that I do want to mention is that it’s surprisingly personal. 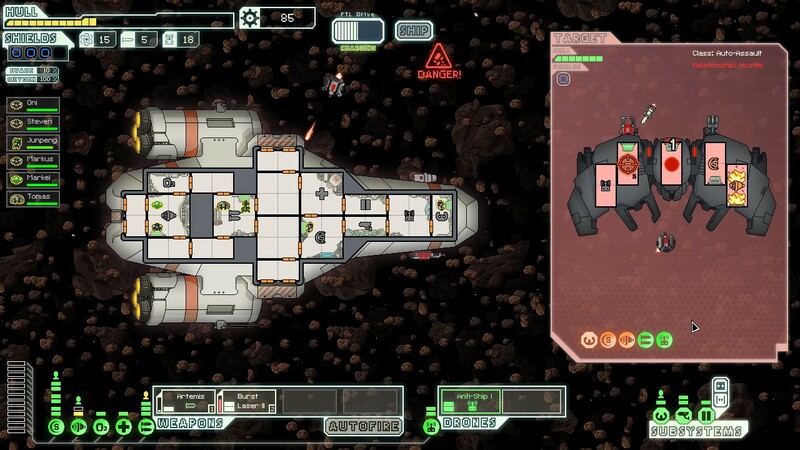 I didn’t expect that—I can’t think of the last roguelike that generated any substantial connection between me and my avatar, so it’s nice to see FTL sink its hook in deep and force a strong investment in the survival of my little crewmen—crewmen who, by the way, have as much a tendency to die horribly as they do to serve admirably as they scurry from battle-station to fire to teleporting invader to repair duty. I haven’t managed to keep a single one alive so far. And that hurts. The happy crew of The Fontenrose XXVIII. It’s pretty common for roguelikes to permit you to name your characters, but for some reason I find the option doubly endearing here. After a few playthroughs I’ve come to name my crews after explorers and adventurers, and their namesakes reflect my outlook for that voyage—so when my mind is sharp and I’m thinking that I’ll evade the Rebel Fleet with ease, my crew gets names like Elcano, Lawrence, Picard, and Cabot; and when I’m tired and off my A-game, they get called Donner, Magellan, Janeway, and Nuttal (whose Wikipedia page could really stand to elaborate on what a dunce explorer he was), names that just scream that something is going to go wrong. Even The Kestrel is usually something more lively, unless I forget to click the little “rename” button before launch. Lately, it’s been The Fontenrose or The Darby O Gill (being racist, the game won’t let put an apostrophe in there) or, when I want to feel super-proud at my ship’s placement on the high-scores chart, The Thurot. Of course, when The Thurot, manned by Spacebiff, Leif, and TonyTiger, gets stranded without fuel and torn to bits from the inside by horrible assault drones, it makes the loss that much more painful. A drone battle amidst an asteroid field. I suspect that one of the reasons that FTL resonates so strongly with me is because I’ve wanted to command some sort of vessel since childhood. In fact, a large proportion of my memories of the mid-’90s are based around a crew of LEGO-people on a voyage around a postdiluvian earth, picking up new allies as I was gifted new sets for Christmases and birthdays—so the original pirates and imperials were eventually joined by knights and ladies, ninjas, jungle dwellers, spacemen, and moderners. At the time I thought it would be a great television serial, complete with oft-killed and just-as-oft-reintroduced main characters and monster-of-the-week plots that would do the worst original Star Trek reruns proud. It’s probably for the best that NBC rejected my pilot script. Anyway. I haven’t really even talked much about FTL (in part because I don’t want to spoil anything), so I’ll condense my meaning into something bite-sized: it’s great. It’s all those childhood captain fantasies compressed into forty minutes. It’s joyous and stylistic and mysterious. And I can’t wait to see the finished version. Posted on July 2, 2012, in Indie and tagged FTL, Indie, The Fruits of Kickstarter. Bookmark the permalink. 5 Comments. Add me to the list of people excited to see the finished FTL. And Dan, any chance of us hearing more about this TV series of yours? I think I subject you folks to enough as it is. I’m glad you added Captain Janeway as one of your dunce explorers. In response to this post, I looked up all the iterations of Star Trek. Completely forgot there was an animated series. Awesome.